and / were 1.7 cm. in inside diameter, and were 38.1 cm. long. They lay in adjustable supports, and were not in contact with the coils which surrounded them. The core around which the wire of the coils was wound was rectangular in section. Around a free space of 4.2 cm. by 2.2 cm. was first a nonconducting layer of 0.6 cm. in thickness, then a space 0.6 cm. thick for the circulation of water; and, lastly, a coil of wire. 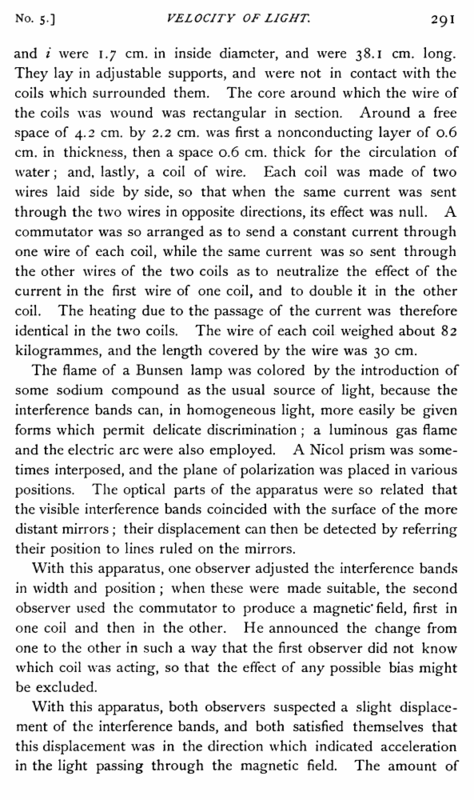 Each coil was made of two wires laid side by side, so that when the same current was sent through the two wires in opposite directions, its effect was null. A commutator was so arranged as to send a constant current through one wire of each coil, while the same current was so sent through the other wires of the two coils as to neutralize the effect of the current in the first wire of one coil, and to double it in the other coil. The heating due to the passage of the current was therefore identical in the two coils. The wire of each coil weighed about 82 kilogrammes, and the length covered by the wire was 30 cm. The flame of a Bunsen lamp was colored by the introduction of some sodium compound as the usual source of light, because the interference bands can, in homogeneous light, more easily be given forms which permit delicate discrimination ; a luminous gas flame and the electric arc were also employed. A Nicol prism was sometimes interposed, and the plane of polarization was placed in various positions. The optical parts of the apparatus were so related that the visible interference bands coincided with the surface of the more distant mirrors ; their displacement can then be detected by referring their position to lines ruled on the mirrors. With this apparatus, one observer adjusted the interference bands in width and position ; when these were made suitable, the second observer used the commutator to produce a magnetic* field, first in one coil and then in the other. He announced the change from one to the other in such a way that the first observer did not know which coil was acting, so that the effect of any possible bias might be excluded. the acceleration thus suspected was not more than one part in one hundred millions. But the displacement was so slight that they could not be confident of its existence. In the examination of the effect of a magnetic field on a ray passing through it, the appearance on making and breaking the circuit suggested the possibility of a change in the density of carbon bisulphide while in the field. There was produced a momentary displacement of the interference bands, which was unmistakable, being many times as great as the displacement which it was suspected continued as long as the current passed. It was easy to imagine that the force which quickly brought the molecules of the liquid into the new positions in which they produce rotation of the plane of polarization, might carry them beyond the position of equilibrium, to which they would quickly return. To examine this phenomenon, a thick brass box filled with carbon bisulphide was placedin each coil, and the two boxes were connected with each other and with a glass tube of small diameter. 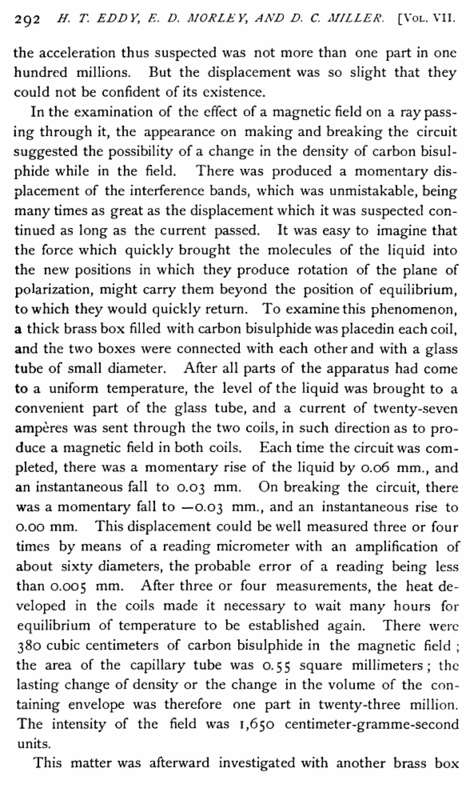 After all parts of the apparatus had come to a uniform temperature, the level of the liquid was brought to a convenient part of the glass tube, and a current of twenty-seven amperes was sent through the two coils, in such direction as to produce a magnetic field in both coils. Each time the circuit was completed, there was a momentary rise of the liquid by 0.06 mm., and an instantaneous fall to 0.03 mm. On breaking the circuit, there was a momentary fall to —0.03 mm., and an instantaneous rise to 0.00 mm. This displacement could be well measured three or four times by means of a reading micrometer with an amplification of about sixty diameters, the probable error of a reading being less than 0.005 mm. After three or four measurements, the heat developed in the coils made it necessary to wait many hours for equilibrium of temperature to be established again. There were 380 cubic centimeters of carbon bisulphide in the magnetic field ; the area of the capillary tube was 0.55 square millimeters; the lasting change of density or the change in the volume of the containing envelope was therefore one part in twenty-three million. The intensity of the field was 1,650 centimeter-gramme-second units.